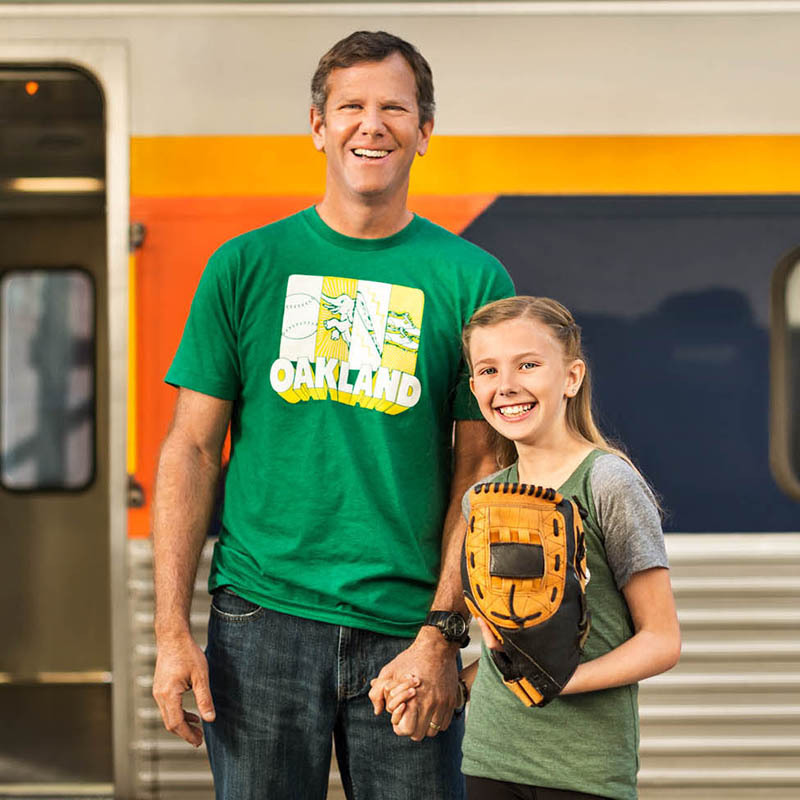 Ditch the traffic and parking hassles and hop aboard the Capitol Corridor for a comfortable and convenient ride to the Oakland Alameda County Coliseum. You can grab a snack in the Cafe Car, enjoy free Wi-Fi, or just sit back and enjoy the view. The Coliseum is an easy 5-minute walk from the station, and with up to 30 trains a day between the greater Sacramento area and the San Francisco Bay Area, it’s easy to find one that fits your schedule – whether that means catching a ball during batting practice or sliding into your seat just in time for the first pitch. On board the train from an UNSTAFFED station. Be sure to enter DISCOUNT CODE V505 when booking at a QUIK-TRAK machine to receive the 25% discount. The 2019 Oakland Athletics Schedule is now available. Please visit the Oakland A’s website, www.oaklandathletics.com, to learn more about ticket package offers and group outings. Keep up-to-date with news and promotions by following the team on Twitter @Athletics or like their Facebook page. *This offer is valid for 25pct off the regular full adult rail fare. This offer is valid for sale and travel between 27MAR19- 01NOV19. Up to one (1) child age 2-12 may accompany each adult at half the regular full adult fare. Seating is limited; seats may not be available on all trains on all days. Fares are subject to availability. This offer is valid for travel on the Capitol Corridor and associated thruways; except not valid on the 7000-8999 thruway series. This offer is valid for travel to Oakland, CA (Oakland Coliseum Station only) and return. This offer is valid for coach seats. In addition to the discount restrictions, this offer is also subject to any restrictions, blackouts, and refund rules that apply to the type of fare purchased. Fares, routes and schedules are subject to change without notice. Once travel has begun, no changes to the itinerary are permitted. This offer may not be combined with any other discount offer. Other restrictions may apply. Please refer to discount code V505. Amtrak is a registered service mark of the National Railroad Passenger Corporation. Capitol Corridor is a registered service mark of the Capitol Corridor Joint Powers Authority. For more information, visit the Oakland Athletics website at www.oaklandathletics.com. For a complete train schedule, including times to/from the Coliseum, visit Capitol Corridor’s schedule page.